Camping? HA! UR DOIN IT WRONG!!! 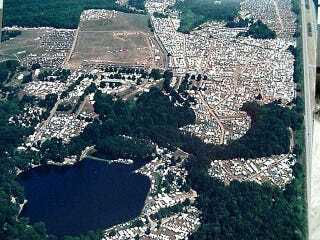 Each year, about 10,000 fair gentles attend the Society of Creative Anachronism’s Pennsic War in the Barony-Marche of the Debatable Lands, better known to mundanes as the area near Pittsburgh, PA. The name comes from the origins of this gathering, a war between the great Kingdoms of the East and Middle. The loser got stuck with Pittsburgh. Though it is possible to camp alone, most choose to camp in groups of friends, clans, and/or people from their local area. My lady and I, for example, will be camping with the Barony of Bergental, encompassing western Massachusetts. (This isn’t their camp, just a cool picture I found.) This way, we can pool resources and share shower and kitchen facilities, as well as camp chores. Oh, and booze, because even in medieval times you can’t camp without it. And there are so many brewers around, who are happy to have you sample their work. And when I stumbled (literally) into the TARDIS in the Bog, I wasn’t sure if I was that drunk or actually seeing it for real. The answer was: both. after all, being a time machine, it’s always appropriate in whatever time period. For two weeks, Cooper’s Lake Campground gains a higher population than many towns for the duration of the war. This includes merchants, performers, security, medical crew, and everything else you might expect to find in a city of this size. So, yeah. Top that, campers. Also, I’ll be offline in early August.